In this work we completely characterize how the frequency with which each player participates in the game dynamics affects the possibility of reaching efficient states, i.e., states with an approximation ratio within a constant factor from the price of anarchy, within a polynomially bounded number of best responses. We focus on the well known class of linear congestion games and we show that (i) if each player is allowed to play at least once and at most β times in T best responses, states with approximation ratio O(β) times the price of anarchy are reached after T ⌈loglogn ⌉ best responses, and that (ii) such a bound is essentially tight also after exponentially many ones. One important consequence of our result is that the fairness among players is a necessary and sufficient condition for guaranteeing a fast convergence to efficient states. This answers the important question of the maximum order of β needed to fast obtain efficient states, left open by [10,11] and , in which fast convergence for constant β and very slow convergence for β = O(n) have been shown, respectively. Finally, we show that the structure of the game implicitly affects its performances. In particular, we prove that in the symmetric setting, in which all players share the same set of strategies, the game always converges to an efficient state after a polynomial number of best responses, regardless of the frequency each player moves with. All the results extend to weighted congestion games. 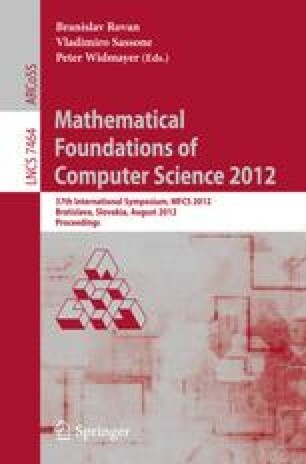 This research was partially supported by the grant NRF-RF2009-08 “Algorithmic aspects of coalitional games”, by the PRIN 2008 research project COGENT (COmputational and GamE-theoretic aspects of uncoordinated NeTworks), funded by the Italian Ministry of University and Research, and by Deutsche Forschungsgemeinschaft (DFG) within the Collaborative Research Center SFB 876 “Providing Information by Resource-Constrained Analysis”, project A2.